One of my favorite topics to talk about is primate enrichment. In the wild primates spent a lot of time hunting for food. As a matter of fact, that is how they mainly keep themselves busy during the day so why not try to mimic this behavior in our homes? The design above is my own creation but it is based on the design of several others that I’ve seen over the years. Some people prefer to use plastic drinking cups but to make this enrichment unit virtual indestructible, I decided to use pipe caps. I had to make some tweaks along the way but am pretty happy with the end-result. 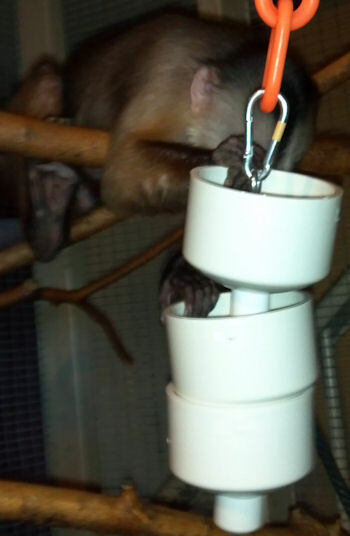 I’ve been using these primate enrichment cups with my capuchin for several months now and he loves it. It’s fairly easy to make, so let’s get started! For those primate owners that have smaller primates like marmosets or tamarins, make sure to adjust the size of the pipe caps and pipe. First you’ll need to drill a 1″ hole through the center of all the 3 drain caps. If you don’t have a 1″ drill like me, use a smaller drill to drill several holes in a circle as shown in the picture below. It looks like a lot of work but it really goes pretty quickly. 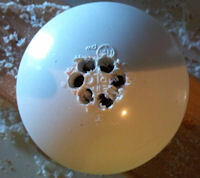 Once you have all holes drilled, I used the drill in a circular motion to cut the hole out and then I used a metal file to make the holes perfectly round. Next cut your 1″ pvc pipe to length. While 8.5″ will seems short, it is important that you don’t make this pipe too long otherwise your primate could potentially smash their fingers between the cups if they can lift them too high. Glue the bottom 1″ pvc pipe cap to the 8.5″ pipe and slide all 3 cups onto the pipe. Drill a small hole through the other 1″ pipe cap and use the nut and lock nut to secure the eye bolt to the cap. It is important to use a lock nut on the bottom because once this is glued into place, you will no longer be able to reattach the bolt if it were to come loose. Now you simply need to glue to top cap onto the pipe and your primate enrichment cups are ready! I used 2 spring snap links (5/16″) to attach this unit to a plastic chain link. When filling up these cups, make sure to use the bottom cup for their most favorite food and the top one for the least favorite food. That way they really have to work for what they love.